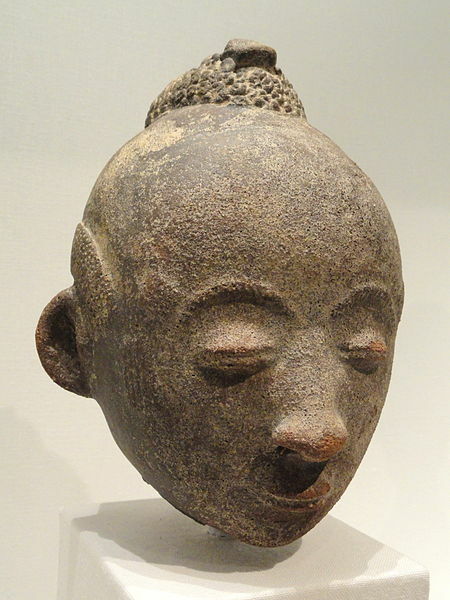 Mmoatia (singular, aboatia) are forest dwellers known to the Akan or Ashanti people of Ghana. In traditional religious thought, they are seen as a subclass of abosom, intermediary spirits or deified ancestors. They are believed to be very short in stature, standing not more than one foot high—although this may be a reference to carved wooden representations of them and not to the beings themselves. They have curved noses and yellowish skin. Their feet are said to point backwards. These beings communicate with each other through a unique whistle language, and whistling in the bush is a sure way to draw their attention. They are credited with a phenomenal knowledge of medicines, which they are willing to impart to herbalists or medicine men. Sometimes Ghanaians are taken by mmoatia that live deep in the woods. Some who are captured by the mmoatia begin to learn their ways and emerge after several years as herbalists. The mmoatia have always lived in the jungle and know how to use its plentiful resources to cure to all diseases. Their favorite food is bananas. Mmoatia are divided into three tribes or bands: Black Mmoatia are harmless, but Red and White Mmoatia are always up to some kind of trickery—though they are not truly malevolent like the sasabonsam, a vampire-like ogre. Mmoatia signify unpredictability, mockery, and trickery. They function as messengers between the realms of spirit and corporeality—messengers of the abosom. From the Stone Age to the Iron Age, Land of Legends attempts to mix fun with the gritty realities of pre-industrial society. The park was actually established in 1964 as a site where archeologists and anthropologists could attempt to recreate ancient civilizations among the natural bogs, lakes, and woodland of the area. The researchers would reconstruct Iron Age farming equipment and housing, attempting to learn more about era’s in the distant past by experiencing them. The actual benefit of the experiments were controversial, but people flocked to the site to watch the pioneering scientists work. Today, the site has embraced the public’s interest in its work and evolved into a park that invites visitors to come and experience life in the past for themselves, all while the experimental reconstruction continues. The major historical reconstructions at the site now include the original Iron Age village, a Stone Age camp, a Viking market, and a smattering of 19th century farm-cottages. Visitors can try their hand at some labor intensive farming, ancient handicraft, or simply watch the archeologists work. This trailer for the Hercules movie starring Dwayne “the Rock” Johnson looks a lot more herculean than the other Hercules movie that came out a while back. Apparently, it takes place after the famous Twelve Labors, but there are flashbacks. I spotted Cerberus, the Hydra, the Nemean Lion, and the Erymanthian Boar. At least we’ll be treated to a Hercules who actually bears some resemblance to his myths. I’d still love to see a Hercules movie where the hero is called by his Greek name, Herakles. Especially if his immortal father is called Zeus, not Jupiter.